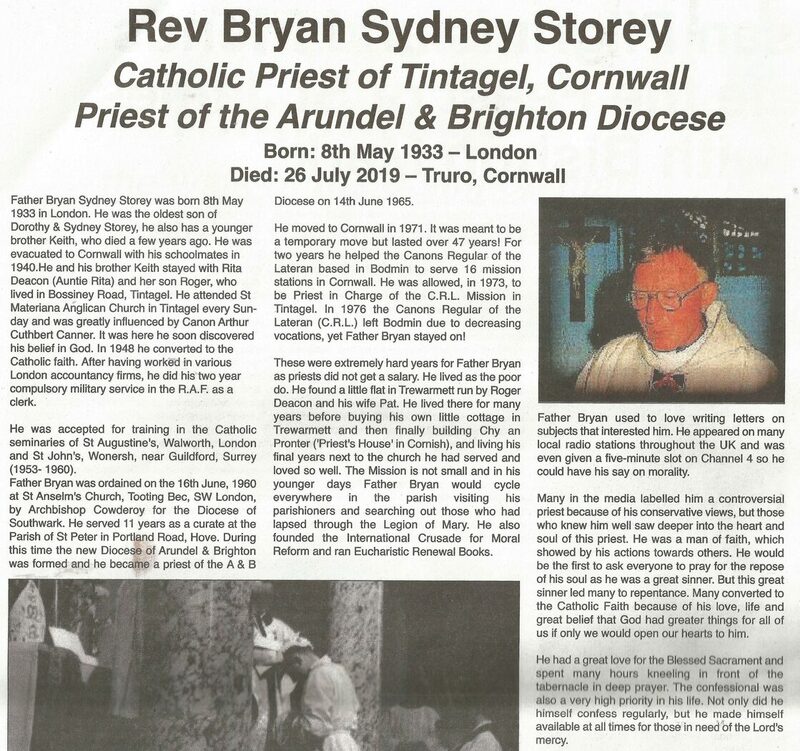 Father Bryan Sidney Storey was born 8th May 1933 in London.He was the oldest son of Dorothy & Sidney Storey,he also has a younger brother Keith,who died a few years ago. He was evacuated to Cornwall with his schoolmates in 1940.He and his brother Keith stayed with Rita Deacon(Auntie Rita) and her son Roger,who lived in Bossiney Road,Tintagel.He attended St Materiana Anglican Church in Tintagel every Sunday and was greatly influenced by Canon Arthur Cuthbert Canner.It was here he soon discovered his belief in God.In 1948 he converted to the Catholic faith.After having worked in various London accountancy firms,he did his two year compulsory military service in the R.A.F. as a clerk. He was accepted for training in the Catholic seminaries of St Augustine’s, Walworth, London and St John’s, Wonersh, near Guildford, Surrey (1953- 1960). Father Bryan was ordained on the 16th June, 1960 at St Anselm's Church, Tooting Bec, SW London, by Archbishop Cowderoy for the Diocese of Southwark.He served 11 years as a curate at the Parish of St Peter in Portland Road,Hove.During this time the new Diocese of Arundel & Brighton was formed,he became a priest of A & B Diocese on 14th June 1965. 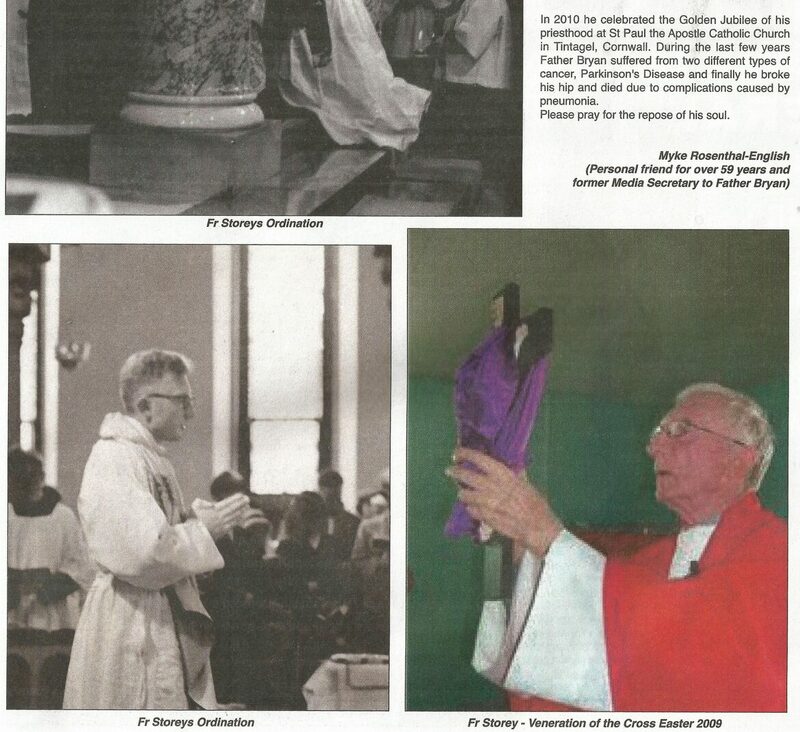 Due to personal circumstances he moved to Cornwall in 1971.It was meant to be a temporary move but lasted over 47 years!For two years he helped the Canons Regular of the Lateran based in Bodmin,to serve 16 mission stations in Cornwall.He was allowed in 1973 to be Priest in Charge of the C.R.L. Mission in Tintagel. In 2000* the Canons Regular of the Latern (C.R.L.) left Bodmin due to decreasing vocations,Father Bryan stayed on!These were extremly hard years for Father Bryan as Priest's did not get a salary.He lived as the poor do.He found a little flat in Trewarmett run by Roger Deacon and his wife Pat.He lived there for many years before buying his own little cottage in Trewarmett and then finally building Chy an Pronter(Priest's House in Cornish),and living his final years next to the church he had served and loved so well.The Mission is not small and in his younger days Father Bryan would cycle everywhere in the Parish visiting his Parishioners and searching out those who had lapsed through the Legion of Mary.He also founded the International Crusade for Moral Reform and ran Eucharistic Renewal Books.Father Bryan used to love writing letters on subjects that interested him.He appeared on many local radio stations throughout the UK and was even given a 5 minute slot on Channel 4 so he could have his say on morality.Many in the media labelled him a contraversial priest because of his conservative views,but those who knew him well,saw deeper into the heart & soul of the priest.He was a man of faith,which showed by his actions towards others.He would be the first to ask everyone to pray for the repose of his soul as he was a great sinner.But this great sinner led many to repentance,many converted to the Catholic Faith because of his love,life and great belief that God had greater things for all of us if only we would open our hearts to him.He had a great love for the Blessed Sacrament and spent many hours kneeling in prayer in front of the tabernacle in deep prayer.The confessional was also a very high priority in his life,not only did he confess regulaly,but he made himself available at all times for those in need of the Lord's mercy.In 2010 he celebrated his Golden Jubilee of the Priesthood at St Paul the Apostle Catholic Church in Tintagel,Cornwall.The last few years Father Bryan suffered from two different types of cancer,Parkinson's Disease and finally he broke his hip and died due to complications caused by pneumonia. His body was recieved at 1600hrs 8th August into the Catholic Church of St Paul the Apostle,Tintagel,Cornwall,U.K.It remained in repose overnight until his requiem was celebrated at 1200hrs 9th August 2018.Principal concelebrant was Bishop Mark O`Toole of the Diocese of Plymouth.His own Bishop Richard Moth of Arundel & Brighton and Bishop Emeritus Rt. Rev. Dr. Hugh Christopher Budd PhL STD of Plymouth Diocese and 14 priests also concelebrated his Requiem.There were also other Priests in the congregation as well as religious sisters and representatives from our brothers and sisters in the Anglican & Methodist churches.One person who attended the Requiem and is not a Catholic told us "There was loads of bishops and priests there, he had a lovely send off .The sun was shining,church full and loads outside.Then a lovely wake at the Social Hall, Tintagel.Food was excellent Father Bryan would of loved all the cake! " Over 200 people attended his Requiem.His body was then taken for a private cremation before his ashes were buried in the Church Memorial garden. Father Bryan's ashes were intered in the Garden of Remembrance adjoining the Church after Mass celebrated by Parish Priest,Father Ciarán McGuinness at 1200hrs on September 5th 2018. Mass was celebrated in Austria for the repose of his soul on Saturday 08th September 2018,the birthday of Our Lady,for whom he had a great love.Another Mass was offered on Saturday 20th of October 2018. Please pray for the Repose of his soul. *Thank you to Rev Father Ciaran McGuinness Parish Priest of Bodmin,Wadebridge,Padstow & Tintagel for correcting the date the Canons Regular of the Lateran left Bodmin for me. example for us all on how to live the Christian virtues.J. May he Rest in Peace N.
Tintagelweb is very sad to announce the death of the very popular Tintagel Catholic Priest Father Bryan Storey today Thursday July 26th 2018, in hospital in Treliske, Truro. I had known Bryan and his late brother Keith since they came to Tintagel as evacuees in 1939. He will be sadly missed in the local area and throughout Cornwall and the World. He could be very controversial but always very plausible in his reasoning. He was very caring, loved Tintagel and it's residents. I used to always stop and talk to him when I saw him strolling down through the village which, when well, he used to do often. The Origional website of Eucharistic Renewal Books. Eucharistic Renwal Books was founded and run by Father Bryan Storey,a Catholic priest who lived in Tintagel Cornwall,U.K. He was really impressed by the books written by Father Tadeusz Dajczer,founder of the "Families of Nazareth" movement.He helped to translate the books into the English language from German.They were origionally written and published in Polish.Father Dajczer died on the evening of September 8th 2009,the feast of the Birthday of Our Blessed Lady. God just can't stop loving me however bad I may be. He waits for me to go to Him all the time. He's always there. In his untiring, constant explorations, Father Tadeusz puts the microscope closer still to the reality of God without whom there's no reality. St. Augustine lost everything he'd ever worked for at the end of his life but he lost nothing. In fact, he gained. In this second book of his meditaions on the Eucharist, the author brilliantly demonstrates how it can be the same for each of us. All our losses can be gains. He introduces us to pathways of untold spiritual joy. In the year of the Priest, this is the book which needs to be on every Priest's bookshelf, to be constantly read and meditated upon- not just by us Priests. It's a message for us all. ‘Increase our faith’ is the third in the series of Father Professor Tadeusz Dajczer’s books on the Eucharist. My conviction grows that the author could write more of these books; he could be writing them all the time since he is totally wrapped up in the Eucharist; he is fascinated and in love with It, quite unable not to talk about this great Love. It has been like this since the day Father Tadeusz discovered that God fell in love with us to the point of total Eucharistic surrender in the living Mystery of the Resurrected Christ. The plea contained in ‘Increase our Faith’ seems to be the really adequate response to that Mystery. Following Our Lord, the author teaches and seeks faith as life’s most precious treasure. Maturity involves seeing God’s action everywhere and experiencing His presence as more real than the world we normally know. Like the Apostles, we need to learn and ripen into more faith. Father Tadeusz tells us that the best book on the Eucharist is the Eucharist Itself; It is the test of our faith just as it was for the people of Capharnaum. I do not believe enough; I do not pray enough. I do not ask for this great gift as I need to; faith ‘touches’ God insofar as I am humble in the spirit of Mary in the Cenacle. We need to remember that in the Cenacle it was Mary who taught the Apostles to persevere in faith by prayer. ‘Magnificat’ sums up Our Lady’s spirituality; that summary uniquely helps us experience the Eucharistic mystery. She first accepted Jesus into Her body to become that extraordinary tabernacle; it is valuable to ask Her to extend Her maternal care for me, together with Jesus whom I receive in Holy Communion. Faith is interrelated belief in the Mass and union with others. If I do not try to live by faith each day, I will lack faith during Mass the author warns. In this book, there are many similar warnings along with other deeply stimulating thoughts. Father Tadeusz tells us that not even for a moment is it worth living without God. The Eucharist helps us as It is the sacrament of love; It is an extraordinary sacrament of extraordinary love. I need to stay with Jesus in the tabernacle as long as it takes almost to feel His heart-beat. Here we may learn how to worship and find a different view of the world and its people. Through the Eucharist, without moving from where we are, everything becomes different. Thanks to the Mass, I become a contemporary of Jesus; through union with Him, I take part in a totally different reality. That reality primarily concerns God’s glory and our salvation. Eucharistic experience allows Jesus to adore the Father in me. This prayer lets Him pray for the living and the dead, leading me to salvation. Thus He sanctifies the world and its people, teaching us to love; that means “looking outward together in the same direction”, to create and accomplish joint goals. The author laments living as if God does not exist, feeling no hunger for God. By this we will surely die unless we ourselves or someone else ask help for us. Our good fortune is that the entire Heavenly Host together with Our Lady, prays for our sanctification through surrendering to Christ Jesus. We are grateful to Professor Dajczer for this new testimony of faith; he inspires us earnestly to follow the Eucharistic pathway; he helps us discover the beauty and richness of interior life; he leads us to find greater openness to this freedom; he underlines how Jesus sanctifies and loves within us and for us so that we can share in His worship of the Father. I have no doubt that this book will be received in gratitude by all who search for faith’s healthy sustenance and enrichment. The last 3 books in the series where printed in one booklet. We could summarise this book by saying it is a deep meditation on the love of God as revealed in the Person of Jesus Christ. It is a meditation on the mystery of His presence in the Blessed Sacrament. This Most Holy Presence can only be discovered and loved by us through coming into a person to person relationship. Only such a relationship leads to the real meeting between God and ourselves. Yet more than this, in the discovery of this relationship, we are introduced into the mystery of another human person in our lives. The Sacrament of God’s Presence is in many respects an unusual book. It urges us to deepen and radically revive our union with This Love which longs to surrender life for us and remain with us in the mystery of the Eucharist. There is no greater love. The author’s meditations on this unusual mystery of our faith are astonishing in depth, freshness and simplicity. This book cannot be simply ‘read’. It needs to be meditated upon and read again and again gradually to discover its inner richness. It speaks of the Eucharist in a completely new and unconventional way; it speaks with the language of living faith and authentic, interior experience. Its content directs the reader in an unusually attractive manner, towards authentic interior life. This is a life of faith, hope and love, a life that may be born, grow and mature, drawing life-giving power from the Eucharist, the Source of all graces. Pope Paul VI wrote that “the Eucharist is the presence which invites us” [Homily on June 13, 1974]. It invites us to special Eucharistic relationship. If during Mass we try to experience the presence of the redemptive event, we shall see how important it is to understand the Eucharist as a mysterious encounter. There are different human encounters. Blessed John Paul II spoke of “night encounters like the one with Nicodemus, chance encounters like the one with the Samaritan woman, provoked encounters like the one with the woman caught in an act of adultery, imploring encounters like the one with the blind man at the gate of Jericho, encounters caused by curiosity like the one with Zacchaeus, encounters distinguishing themselves with great nearness like encounters with the Apostles called to follow Christ, unexpected encounters like the one with St. Paul on the road to Damascus (…). Yet the encounter of the greatest nearness, the one that transforms us profoundly and upon which all others depend, is the encounter at the Table of the Eucharistic Mystery (…), Here Christ personally receives us burdened with trouble and strengthens us with the warmth of His understanding and His love” [John Paul II, Homily on July 9, 1980.]. Jesus Christ truly present under the species of bread and wine is God, unusually close to us and simultaneously our only Sense and Aim. However, as the author makes us aware, there are still many set patterns of thinking, supports and reliances which need to fall away; many things taken for granted need to collapse so that the Only Sense revives our everyday lives to give birth within us the “prayer with action”, “the prayer of touch” for every eventuality. In Father Dajczer’s meditations, we can find a particular encouragement prompting us directly towards such prayer. This “prayer with action here and now” is born in discovering the Real Presence of Christ in the Eucharist, coming into relationship as we meet Him. When we have found this union, it gives birth to an inner unending desire from Him that this endures for ever. The Sacrament of God’s Presence continues ideas found in the author’s three previous books in the series of Meditations on the Eucharist: The Mystery of Faith, Amazing Nearness and Increase Our Faith. In Poland, they sold out very quickly. To contemporary men and women, often living in an atmosphere of unbelief and secularism, rarely concerned with the mystery of personal existence, to those who do not discern God on the altar any more since ‘the world’ and ‘I’ have obscured God, our author directs Eucharistic meditations. He says we will not convert nor choose God to the end if we do not believe that God loves us exclusively and that He reveals this love to us everyday from the Eucharistic altar. Father Professor Tadeusz’s meditations on the Eucharist reveal his ecclesiastical thinking and love of the Church. He longs for all of us to share this love. Living this interior attitude, the author writes for the whole Catholic Church, craving that it lives ever increasingly with the greatest Treasure it possesses on this earth, i.e. the Treasure of Love, the love which desires this Presence. It does not want to be fully understood but it craves exclusively to bond with us. Bending with faith over the book by the Reverend Professor - Father Tadeusz Dajczer bearing the title “With the Force of Faith. Meditations on the Eucharist” we ask a very fundamental question: “What is Eucharist?” A countless number of works and dissertations have been written about it. And dispite the most tremendous efforts there is no way to render the unusualness and religious richness of the Eucharist. As indeed for a believer it is the everlasting and priceless mystery. We shall therefore care for the true and complete theology of the Eucharist and “living by the force of faith”. This care will protect us against the descent into the empty verbalism deprived of sacrum and the arbitrariness of the exercised cult. ”How can we not return ever anew to this mystery, which contains the entire life of the Church?” - asked God's servant John Paul II in the Letter to Priests for Holy Thursday of 2000. “Let us remain faithful to what the Upper Room “hands on” to us, to the great gift of Holy Thursday. May we sit at the “school” of the Eucharist.” This task set by John Paul II wins particular meaning in the Year for Priests 2009-2010 proclaimed by Benedict XVI which with certainty will be a deeply Eucharistic time. Going into the content of the Reverend Professor's meditations based on the Revelation, the Magisterium of the Church and statements of the saints, we confirm that the Eucharistic presence is not a usual remembrance, but “making present” of the living, real presence of the Lord amongst us. The Holy Spirit, being constantly active in the Eucharistic liturgy, will always remain its guarantor so that the bread and wine become the Body and Blood of Christ. It is the same Holy Spirit that came down upon Mary and the Apostles (Acts 2,14) and told them to go into all the world to preach God's word, make disciples and gather God's people for “breaking of bread” (cf. Acts 2,42). “Do this in remembrance of me” (Lk 22,19). This Eucharistic act of transformation of bread into His Body and wine into His Blood done by priests will make present the work of Christ in each generation of Christians and each part of the earth until His Second Coming. Wherever the Eucharist will be celebrated, the sacrifice of blood on Calvary will be made present there in the bloodless manner and Christ Himself, the Redeemer of the world, will be present there. Expressing thanks to the Reverend Professor for this new testimony of faith, I hope that this book allows wide range of readers to deepen their faith in Eucharist and live the Eucharist in everyday life. Indeed, Christianity as the religion of encounter of Tripersonal God with human, has the unutterable God’s Gift in the form of the Eucharist. As Father Prof. Cz. 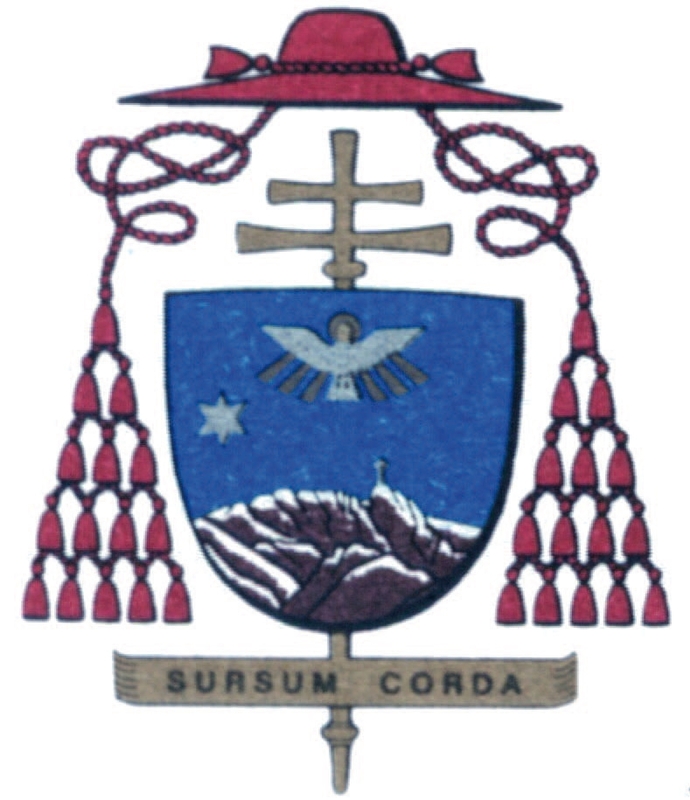 S. Bartnik rightly notices – “the sections of Christianity which cut down or even broke the Eucharistic tradition rejecting the sacramental Church, the priesthood, the celebration of the integral Holy Mass, become immensely impoverished spiritually or even die out under our very eyes” (The Eucharist, Lublin 2005, p. 11). The Gift of faith, that brings us onto each threshold of the Mystery of the Eucharist, teaches us humbleness and understanding that it is not only for theologians alone or the group of “the initiated”, but it continuously remains “the undiscovered Gift” for every Christian. Each of us is called to give an answer to this Gift in a free and judicious manner and show “the obedience in faith”. For each encounter with Eucharistic Jesus – as emphasizes the Author of the already sixth book on this matter - “is woven from theological virtues: faith, hope and love (…). And this different seeing of the world gives birth to the interior peace in us and opens us to successive comings of God and His grace.” (p. 95, 102). Reading closely these meditations, which usually end with a prayer, we discover that for the life of the Church it has always been important that in the Eucharist – in the force of the Holy Spirit – on the altars of the world takes place the real transubstantiation of bread into Body and wine into Blood of Jesus Christ, the Only Redeemer of the world and man. Our Lord and Saviour uses bread and wine, “lifts them up, as it were, out of the setting of their normal existence into a new order. (…) There, where he has laid his hand, something new has come to be. This points us back again to the fact that being a Christian as such is to be transformed, that it must involve repentance and not just some embellishment added onto the rest of one’s life. It reaches down into our depths and renews us from those very depths. The more we ourselves as Christians are renewed from the root up, the better we can understand the mystery of transformation.” (cf. J. Ratzinger, God Is Near Us: The Eucharist, the Heart of Life, Ignatius Press, San Francisco 2003, p. 86). I think I will be an exponent of those all, who shall reach out for this another book of Eucharistic meditations, to warmly thank Father Professor Tadeusz Dajczer for his tremendous commitment to ministration of discovering of the Gift of the Eucharist and conveying the Christian faith. In the times of relativism of truths and upsetting of values based on Jesus Christ’s Person and Work, affirming the truth of His real presence with us and among us is not only inestimable, but necessary. I give my acknowledgement for FIDEI Publishing that took care for the typesetting and the layout from the first book in the series.